If you look for the name "Levenshtein" with a search engine, you end up with umpteen websites. All dealing with Levenshtein distance, but hardly any of them mentions the person behind concept. Vladimir Iosofovich Levenshtein (Влади́мир Ио́сифович Левенште́йн) is the man behind the famous Levenshtein distance. He is a Russian scientist, as you might have guessed by his name. He is famous for his reasearch and contributions in information theory, error-correcting codes, and combinatorial design. Whenever you use a program or an application using some form of spell checking and error correction, the programmers most likely will have used "edit distance" or as it is also called "Levenshtein distance". His ideas have widely permeated our everyday life, but there is hardly any non-scientist who knows him. Wikipedia mentions that he graduated from the Department of Mathematics and Mechanics of Moscow State University in 1958 and has worked at the Keldysh Institute of Applied Mathematics in Moscow ever since. He is a fellow of the IEEE Information Theory Society. He received the IEEE Richard W. Hamming Medal in 2006, for "contributions to the theory of error-correcting codes and information theory, including the Levenshtein distance". If you know Russian, you can visit Levenshtein's personal homepage with an overview of all his publications. On his website also that he studied Mechanics and Mathematics at the Moscow State University, a fact not mentioned somewhere else. This chapter covers the Levenshtein distance and presents some Python implementations for this measure. There are lots of use cases for the Levenshtein distances. The Levenshtein Distance and the underlying ideas are widely used in areas like computer science, computer linguistics, and even bioinformatics, molecular biology, DNA analysis. You can even measure the similarity of melodies or rhythms in music1. The Levenshtein distance has widely permeated our everyday life. Whenever you use a program or an application using some form of spell checking and error correction, the programmers most likely will have used "edit distance" or as it is also called "Levenshtein distance". You might already have encountered another possible use case for this concept: Imagine that you are using a Python dictionary, in which you use strings as keys. If a human reader looks at these misspellings, he or she will have no problem in recognizing the city you have in mind. The Python dictionary on the other hand is pedantic and unforgivable. It only accepts a key, if it is exactly identical. The question is to what degree are two strings similar? 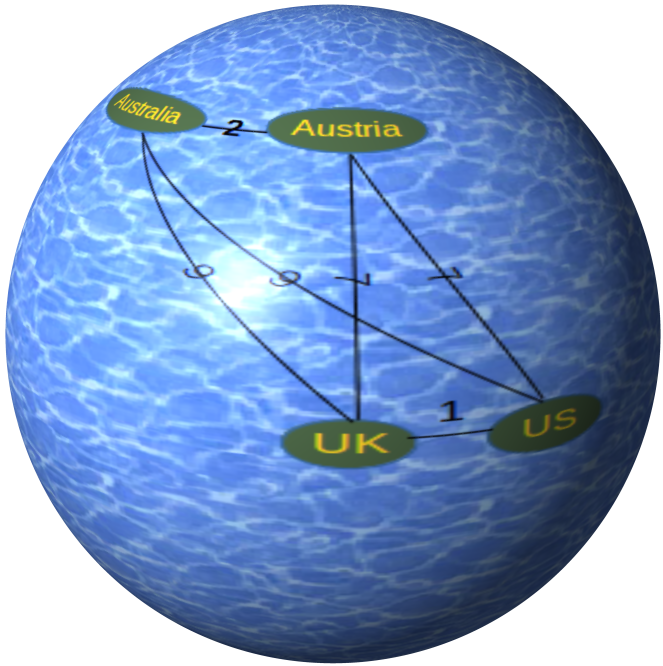 What we need is a string similarity metric or a measure for the "distance" of strings. A string metric is a metric that measures the distance between two text strings. 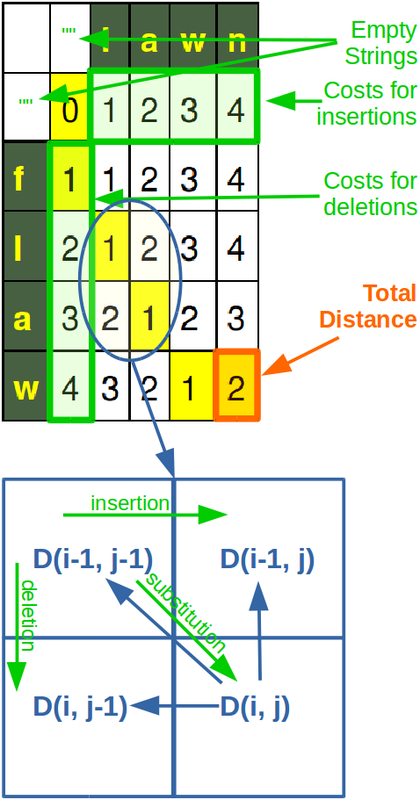 One of the best known string metrics is the so-called Levenshtein Distance, also known as Edit Distance. Levenshtein calculates the the number of substitutions and deletions needed in order to transform one string into another one. The minimum edit distance between two strings is the minimum numer of editing operations needed to convert one string into another. The editing operations can consist of insertions, deletions and substitutions. We can assign assign a weight or costs to each of these edit operations, e.g. setting each of them to 1. It is also possible to argue that substitutions should be more expensive than insertations or deletions, so sometimes the costs for substitutions are set to 2.
where 1ai≠bj</sub> is the indicator function equal to 0 when ai=bj and equal to 1 otherwise, and leva,b(i, j) is the distance between the first i characters of a and the first j characters of b. It is at least the difference of the sizes of the two strings. Triangle inequality: The Levenshtein distance between two strings is no greater than the sum of their Levenshtein distances from a third string. LD was called 29737 times! The function was called 49 times! The function was called 127 times! The additional calls come from the fact that we have three unconditional calls as arguments of the function "min". 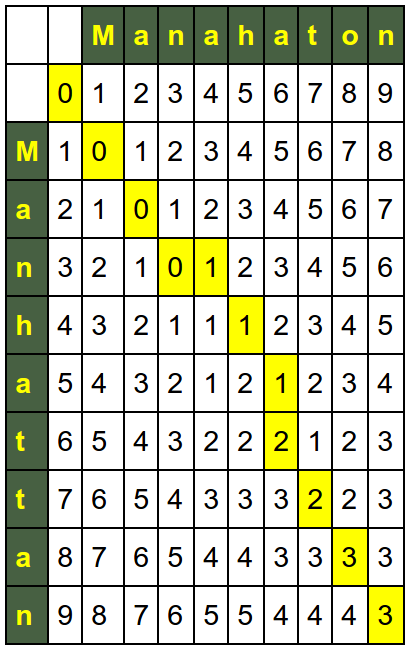 To compute the Levenshtein distance in a non-recursive way, we use a matrix containing the Levenshtein distances between all prefixes of the first string and all prefixes of the second one. We can dynamically compute the values in this matrix. The last value computed will be the distance between the two full strings. This is an algorithmic example of a bottom-up dynamic programming. We set the cost for an insertion, a deletion and a substitution to 1. 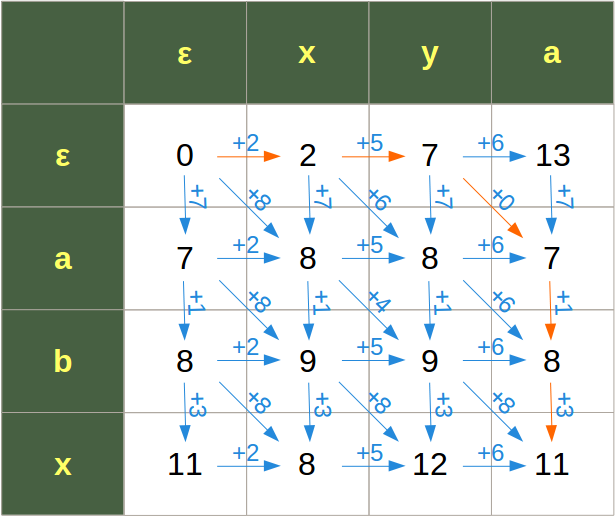 We want to calculate the distance between two string s and t with len(s) == m and len(t) == n. A matrix D is used, which contains in the (i,j)-cell the Levenshtein distance between s[:i+1] and t[:j+1]. The values of the matrix will be calculated starting with the upper left corner and ending with the lower right corner. We start with filling in the base cases, i.e. the row and the column with the index 0. Calculation in this case means that we fill the row with index 0 with the lenghts of the substrings of t and respectively fill the column with the index 0 with the lengths of the substrings of s.
The values of all the other elements of the matrix only depend on the values of their left neighbour, the top neightbour and the top left one. 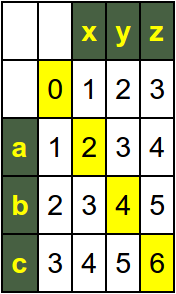 The following picture of the matrix of our previous calculation contains - coloured in yellow - the optimal path through the matrix. We start with a deletion ("f"), we keep the "l" (no costs added), after this we keep the "a" and "w". The last step is an insertion, raising the costs to 2, which is the final Levenstein distance. For the sake of another example, let us use the Levenshtein distance for our initial example of this chapter. So, we will virtually "go back" to New York City and its thrilling borough Manhattan. We compare it with a misspelling "Manahaton", which is the combination of various common misspellings. So far we have had fixed costs for insertions, deletions and substitutions, i.e. each of them was set to 1. It is also possible to have indivual weights for each character. Instead of passing a tuple with three values to the function, we will use a dictionary with values for every character.